As some of you may already know, I recently built an assembly table (32” x 48”) using dual purpose track. I needed more clamps (who doesn’t?) to provide proper coverage of the large surface area and saw the new AutoLock T Track clamps in Rockler’s catalog. I watched a few product demonstration videos and decided to give them a try. What a great design. The large wheel makes tightening in position a breeze with plenty of leverage to hand tighten in position. Another brilliant feature is the ease with which you can adjust the clamping force. Access is readily provided on top for a screw driver adjustment. I would have no hesitation in using them to glue up boards with biscuits. They have additional screws in the bottom so you can lock the clamp at a 45 or 90 degree angle. They are designed to sit in the recess of the track, once positioned. I found that removing them entirely works best and keeping the clamps perpendicular to my work has not been an issue in this configuration. These clamps are designed to work with their track which use 5/16”-18 thread\bolts. With a little patience, they can be ground down and filed to fit 1/4”-20 track solutions like I did. The quality of the materials, the heft of the cast parts, and the limited use of plastic is impressive. You quickly realize why they are so proud of them. I would have to recommend you try them. 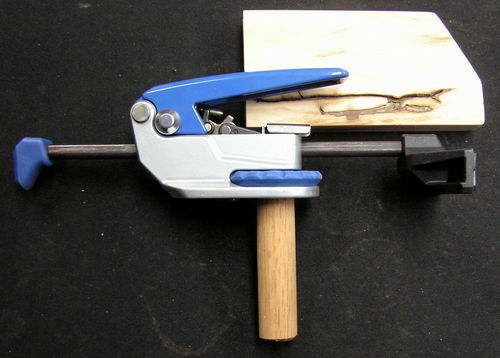 Has made the cumbersome task of adjusting clamps a thing of the past. My philosophy is, contribute or die. This site is a wealth of knowledge that is freely given. I just want to do my part. Excellent review. I need (want) some of these! I like that you can slide the ram forward or backwards as needed. I like your table… very handy design. Thanks Matt. I am very proud of the design and how flexible it is to configure for the project at hand. These look like what I am looking for with one exception; do you think they can be modified to fit 3/4” bench dog holes? Yes, and if you design it right, it should not sit too high up off the table. There are screw holes in the bottom so mounting a dowl will be easy. Well I used the recent free shipping offer from Rockler to purchase the clamps. These are well made, with good fit and finish. I had some 3/4” oak dowel stock I purchased from HD in my shop(twisty, oblong cross section w/ variable diameters, aka typical imported HD wood). Though out of spec for fine work these dowels worked well enough as stock for the dogs. I picked up a pair of 5/16” x 3” hanger bolts. After marking the center and pilot drilling the holes w/ a drill press and centering vice I then completed a through hole with a 9/32” bit. 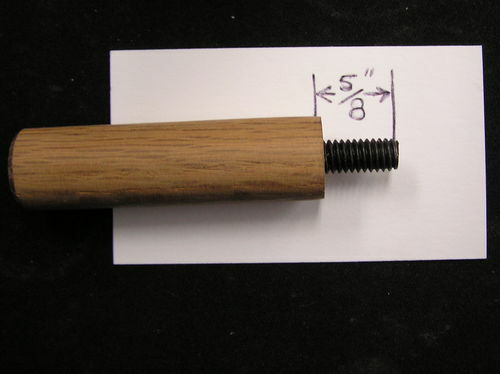 This allows the bolt to lightly engage the wood threads of the hanger bolt which is enough to pull it into position w/o splitting the dowel ( I attempted to use a smaller hole for a tighter fit however I kept splitting the dowels, better dowels might allow one to do so). When in use the clamp exerts a lateral force on the bolt/dowel assembly rather than a tension force so this marginal interference fit between the bolt and dowel will work fine, I ran thin CA glue down both ends of the bolt/dowel holes so they are held in there pretty securely now. 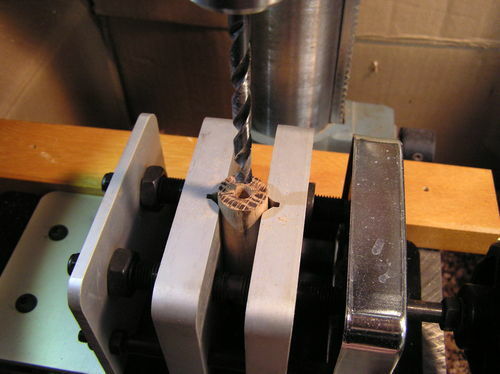 I made sure that the end of the dowel which makes contact with the bottom of the clamp is at 90 deg to the axes of the bolt ensuring square engagement between the two surfaces so that upon tightening the dowel fixture to the clamp there would not be any lateral forces which might encourage splitting the dowel. I found that 5/8” of the machine threads projecting out the end of the dowel will allow for full engagement with the tightening ring of the clamp. This allows for maximum engagement with the clamp w/o interfering with any of the operating mechanism of the clamp. Over all I am very pleased with the outcome. Great solution OnHillWW. I am constantly finding new uses for this versatile and well made clamp solution. I’m in the process of making a finish table right now. Was wondering where you got your tracks from?? Would love to get some of the same! I m in the process of making a finish table right now. Was wondering where you got your tracks from?? I got them from WoodPeckers. I just asked them and they anodized them for me for no charge extra. GREAT IDEA! 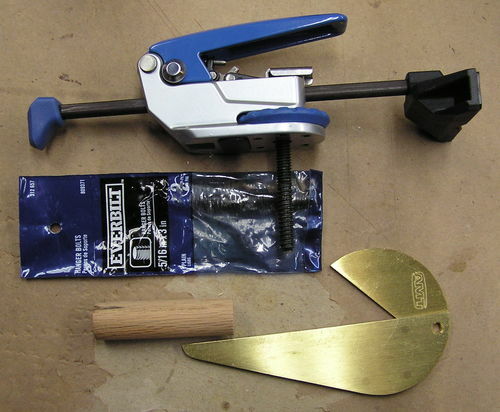 Did you try this with the Kreg Clamp also? As some of you may already know, I recently built an assembly table (32” x 48”) using dual purpose track. I needed more clamps (who doesn t?) to provide proper coverage of the large surface area and saw the new AutoLock T Track clamps in Rockler s catalog. I watched a few product demonstration videos and decided to give them a try. These clamps are designed to work with their track which use 5/16”-18 threadolts. With a little patience, they can be ground down and filed to fit 1/4”-20 track solutions like I did. Great Writeup! What is the benefit of the Dual Track? Is each track same size? What type of Bolts are you using for each of your clamps. I noticed the bolts that came with the Rockler Clamp are not as wide as some of their other t-slot bolts. Did you have any issues with this? Let me know what hardware works best with your T-tracks please.